What kind of bread rolls are you looking for? 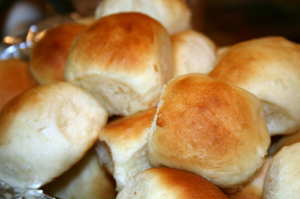 Rolls & Breads are perfect addition to any meal. You can have anytime of the day. For Breakfast, brunch, lunch, dinner or a late night snack. In a small sauce pan put in margarine, sugar and salt. Put pan over low heat until sugar has dissolves and margarine melts. Now let cool to lukewarm. Dissolve yeast in water in a warmed mixing bowl then add milk mixture and eggs. Using a dough hook on your mixer on low speed add 1/2 at a time of flour until dough is not longer sticking to sides of bowl or you run out of flour. Remove from bowl and knead on flour surface for 2 minutes. Place dough in buttered bowl, turn over once to butter top. Then cover and set in a warm place. Free of drafts. Let rise for about 1 hour, or until doubles in size. Punch down dough. On a Grease pan place your dough into desired roll shape (pictured above is rolled in to balls)about 2 inches apart and let rise for about 1 hour. .
Preheat oven to 425F degrees. Bake for 12 minutes or until golden brown. Remove from pan and let cool on wire racks. In large bowl dissolve yeast in water with 1 tablespoon sugar. Pour in sugar, eggs, salt, shortening and 2 cups of flour. Beat together until smooth. Mix in remain flour. Scrape sides clean of dough and knead dough in bowl for 3 minutes then cover and let rise in warm place for about 1 1/4 hours until doubled that is free of drafts. Punch down dough and divide in half. Roll each half in to a 13 inch circle brush on butter. Cut into 9 to 12 equal triangle wedges. Now by starting with the widest side and start rolling to tip. Place tip point side down on pan. Cover and let rise for about 1 hour. Preheat oven to 400F degrees. Lightly Brush tops with butter. Bake for 12-15 minutes or until golden brown. If desire brush with more butter and let cool.